Rock Solid Family - Page 2 of 39 - Trusting God to help us build a Rock Solid Family one pebble at a time. Join our Rock Solid Family to receive updates straight to your inbox. And get our FREE ebook, "Don't Quit: Build a Legacy of Commitment" today. We are experiencing growth here at Rock Solid Family. In the past couple of months I have experienced what it is like to have a Consultant. Brenda McGraw is an excellent Mastermind and Consultant and if you have goals and dreams in your life that you need help to reach without giving up everything else important to you I highly recommend you contact Brenda. Because of Brenda’s help I plan to have my book finished by this summer. I will give more details on that in a later post. Also in events over the past month we went as a family (minus our oldest daughter) to the World Missions Seminar. If you haven’t read those posts we are planning to move our family as Missionaries to Argentina as soon as God provides a church to send us. I learned a lot from WMS and will write another post soon with more about it. And finally I want to share a book called The Art of Work by Jeff Goins which he is launching this week. If you are looking for your purpose and calling in life you will really like The Art of Work. It really changed the way I look at the things I’m doing and how it all ties together with my and my family’s calling. There is no reason we have to settle for less than what God wants us to do. The book launches Tuesday but he has a special going on for pre-orders. You can go to ArtofWorkBook.com to learn more about this special deal and the bonuses that go with it. This is the last day to get his book for only the cost of shipping plus the bonuses that come with it so I thought I would share that with you all. 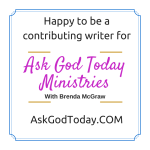 I wrote a blog post for Ask God Today last Friday but was so busy over the weekend I didn’t take time to post about it here. 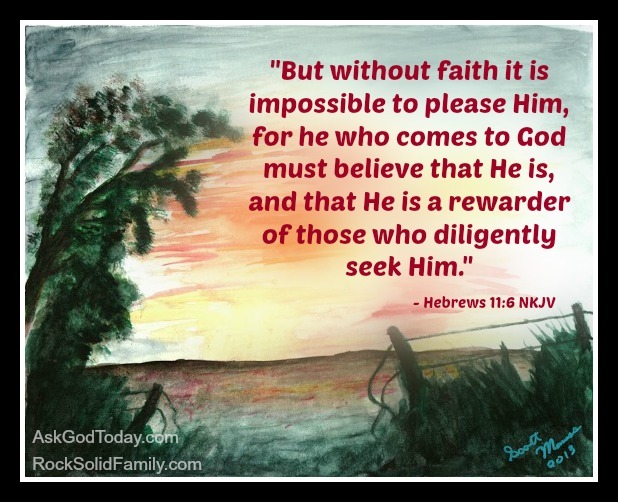 So if you want you read the devotional I wrote entitled Barak: Reluctant Faith . Oh and one more thing that I forgot to mention… For my homeschooling friends there is a Sonlight Curriculum Give-A-Way taking place. You can register for free and they will give you a special link to share with your friends. For every person that registers under your link you get another entry for the drawing. And yes if you register under my link I will get an extra entry too. 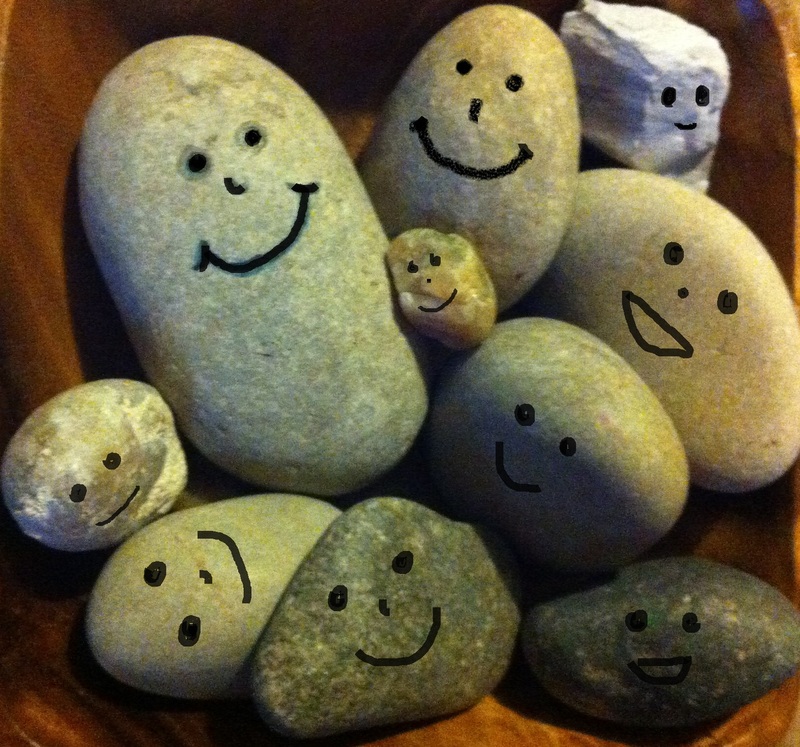 Finally what can you expect in the future from me and my Rock Solid Family? Thanks to some of the people and resources mentioned above I actually do have a plan. One of my plans is to start a series of posts of Frequently Asked Questions. I’ll make a page to go along with this series so anyone can find the questions people frequently ask us. Do you have a question for us? You can ask it in the comments or send us an email. Your question could turn into a blog post. Thank you all for joining us as we improve and grow little by little through this year. We are all excited about what lies ahead. Note: I’m an affiliate for The Art of Work book which means that if anyone purchases something with my link I may receive a portion of the proceeds. Enoch is a little talked about man with only a few verses in the Bible that refer to him. However those few verses speak great volumes about his testimony. Did you know that Adam was still alive when Enoch was born? 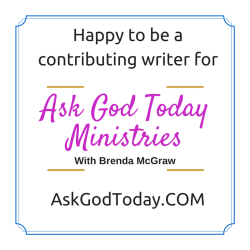 I’ve actually wrote more about that over at Ask God Today. I have joined a team of writers and this month we are going through a Bible Study entitled “A Mighty God and the Broken Faithful“. We would love for you to follow us as we study about the faithful men and women in Hebrews 11. As we find ourselves getting older we tend to talk about what life used to be like. I wonder if Adam told his children stories of what life was like before the earth was cursed? The Bible really doesn’t say much about Enoch. All we have is a few simple verses that hold a world of meaning. In a world that was forgetting about God, why did Enoch stand out? Why did he choose to walk with God? This is how I imagine it based on these few verses about Enoch. Adam was 622 years old when his great-great-great-great-great-great grandson, Enoch, was born. Let’s imagine Adam sitting with young Enoch at his side, telling the story of how the Garden looked the day he named the animals. You can read more about how Enoch Walked with God at Ask God Today. Do you have that kind of close walk with God? Did you have someone like Adam that shared the God’s message with you? Please share in the comments or if you want to read more and comment over at Ask God Today I’d be honored to see you there. My grandmother and parents with their arrows. My brother, Jason, posted a message on our mother’s Facebook wall. It was about the verses in Psalms that talk about children being an heritage of the Lord. Hey Mom, I saw this and made me think of you and Dad …. Love ya’ll and miss you. This was my mother’s reply and I thought it was so beautiful it had to be published. Jason, thanks for sharing this!! I love it!!! I do constantly pray for you as a missionary and Stacie and Sarah as preachers wives. 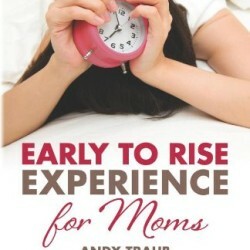 It is true about the comfort parents feel when their children are doing well financially. But money isn’t everything. I feel much better about the safety and security of my children knowing they are serving the Lord because I know he is better at knowing what is best for you all than I am. I am thankful that the Lord blessed us with a quiver of 3 wonderful children and that you are all serving him. France is a long way from here and if Stacie and Scott go to Argentina in the future, it is about the same distance from here. And even though Palestine, TX is not that far from us, it is still too far for me to see everything that is going on in Sarah’s life and help her through everything I would like to. But these places are not far from the Lord. In fact, He is right there with all of you and can give you a comforting hug when I can’t. I will continue to pray for the arrows we were given to land where He wants them to and comfort me when I get to missing our arrows too much and hopefully allow us to fly over and visit them or them fly our way occasionally. I love my parents. I consider it an honor to be one of their arrows. 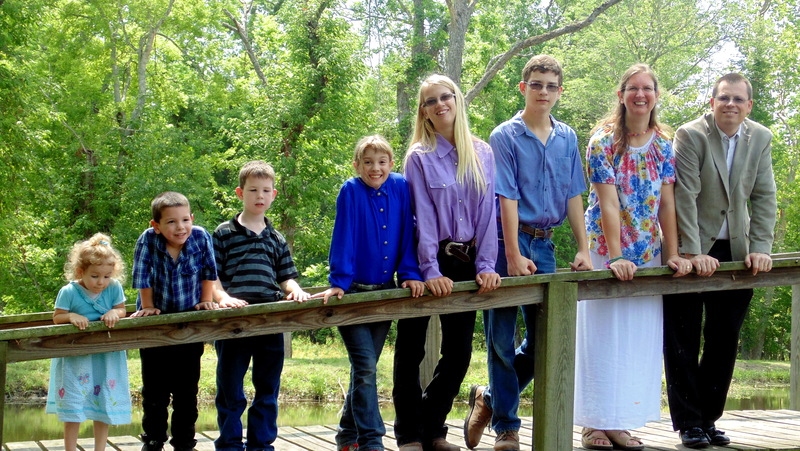 I pray when my children are ready to leave our home they will fly straight to the target God has for them. I’m sure there will be moments I will be scared for them. There will be times I will have to sit back and watch prayerfully from the sidelines. It might be tempting to hold on tight to those arrows in fear that they might break. However if I don’t let go would they be fulfilling the purpose God has designed for them? Have you ever had to let some arrows fly? If you haven’t had to let those arrows go yet what do you think the hardest part will be? Please share your experiences of letting go in the comments. Those days are coming upon us quickly as our son Joshua will be 17 in June. I would love to hear your experiences and advice. 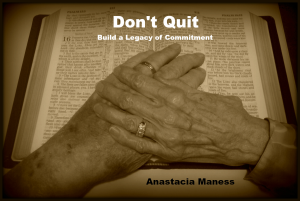 Have you gotten our free book “Don’t Quit: Build a Legacy of Commitment”? If not click on this picture to sign up for your free copy today. 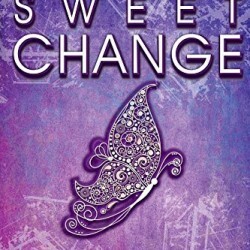 Linking up with Susan B Mead’s #DanceWithJesus link up. Jonathan is standing beside several unfinished projects. Each year starting in 2013 I have been choosing a word for the year. 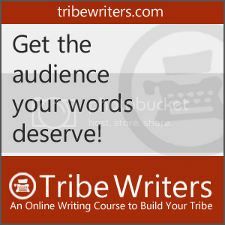 In fact it was a blog post by a fellow Tribe Writer called “Why you should have One Word for 2013” that got me started. Picking a theme word each year has really revolutionized my goal setting and how I keep up with it all. Now I pick one simple word. A word that all my goals and aspirations can snuggle up to and get comfortable with. In 2013 my word was “Determined”. All that determination helped me get my writing off the ground. 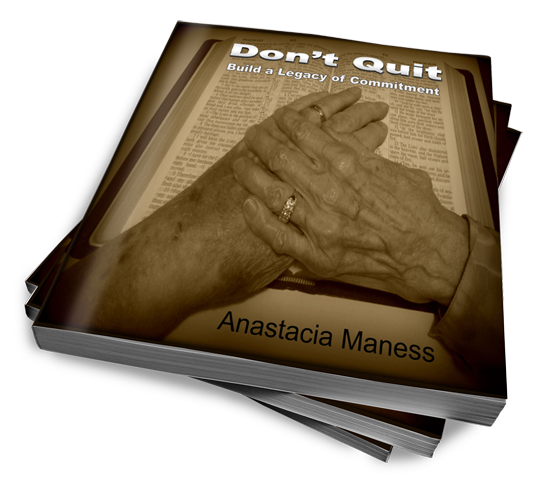 I finished my manifesto “Don’t Quit! Build a Legacy of Commitment“. Which you can download the pdf for free right here on my site. It was a really good year for my writing. That year I wrote a post about how my Life is Like a Boat. Despite all my determination I still felt unbalanced. I decided maybe if I chose the word “Organize” for 2014 I would find that balance. My family and I accomplished a lot in 2014. We got most of the house cleaned up. We traveled a lot without losing too many things. It was a very good organized year (at least organized for me). Even though things aren’t perfectly organized yet, it is better. I feel this past year was a successful year. We did so much more that we wouldn’t have done if I hadn’t even tried. Now you are probably wondering about my word for 2015. I struggled to decide on a word. I started thinking about it in December as I was trying to do last minute organizing. One of the things I need to work on is making sure I keep my priorities straight. It sounds very noble. Make a list of the things that are the most important and focus on those things this year. However I couldn’t put my finger on why I didn’t quite feel that word working for me. As I tried to write down some things that I wanted to do this year using “Prioritize” as my key word my goals just looked flat. 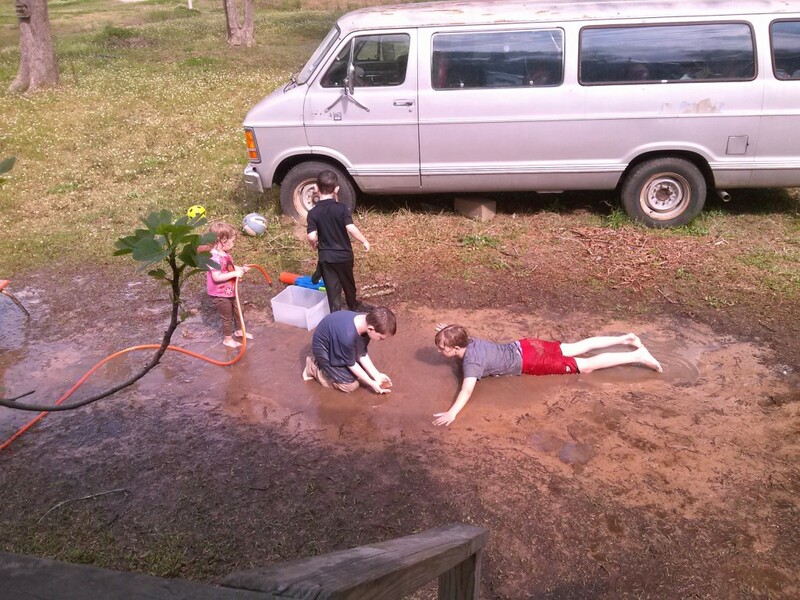 My husband and I had our children list some things they wanted to accomplish this year. They wrote some pretty good goals and some lofty ones that will take them a lot of work to accomplish. 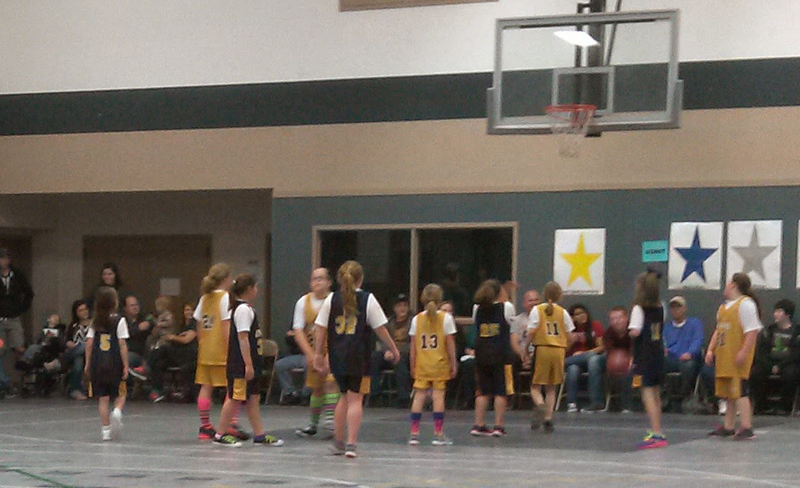 Most of them were very good goals and they can achieve them all if they work hard at it. New Year’s Eve my husband and I sat down with the kids and talked with them about their goals. I told them that one of the things I would like to see this year are goals actually being accomplished. I told them that if they set out to do a project I want to see those projects finished this year not just started. Then my word for 2015 hit me between the eyes…”Finish”. My children are not the only ones that need to finish things. Suddenly my mind went to all the unfinished projects I have laying around the house. I never finished crocheting a blanket I started around 10 years ago. I’ve worked at it off and on (more off than on) but never finished it. I have a lot of blog posts just from this past year that I started writing but never finished. I have books that I planned to write and some I even started but never finished. I look back on my life and realized that a lot of those unfinished projects stem from a problem in my mind. Somewhere in my life I got into the bad habit of assuming things weren’t going to get finished. For way too long I have set myself up for failure. This year I’m going to finish. I’m going to finish that blanket. I’m going to finish getting organized. I’m going to finish cleaning my house up. I’m going to finish writing a book. I’m going to finish the writing courses I started. I’m going to finish reading my Bible through. Everything I start I’m going to make plans to finish. I’m going to help the kids finish their projects as well. This year will be very productive and I’m going to keep a list of every project we finish. I already know our Rock Solid Family will finish this New Year out strong. How about you? Do you have some goals for this year? If you were to summarize them into one word, what would that word be? I can’t wait to hear from you. Please share your word for the year in the comments. Together let’s make 2015 the best year yet! Right now? 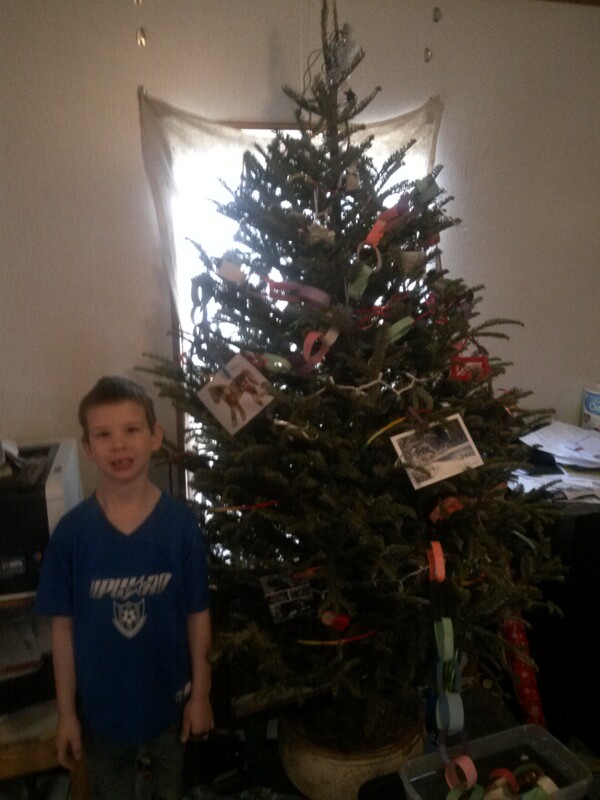 I am going to finish taking down that Christmas tree! 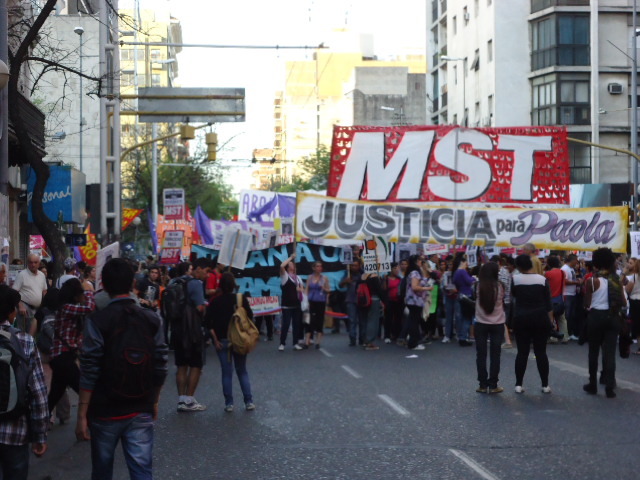 In my last post about our 3rd Week in Argentina I told about our time in Buenos Aires, Pilar, and Posadas. God really blessed us during the week that we spent in those cities. 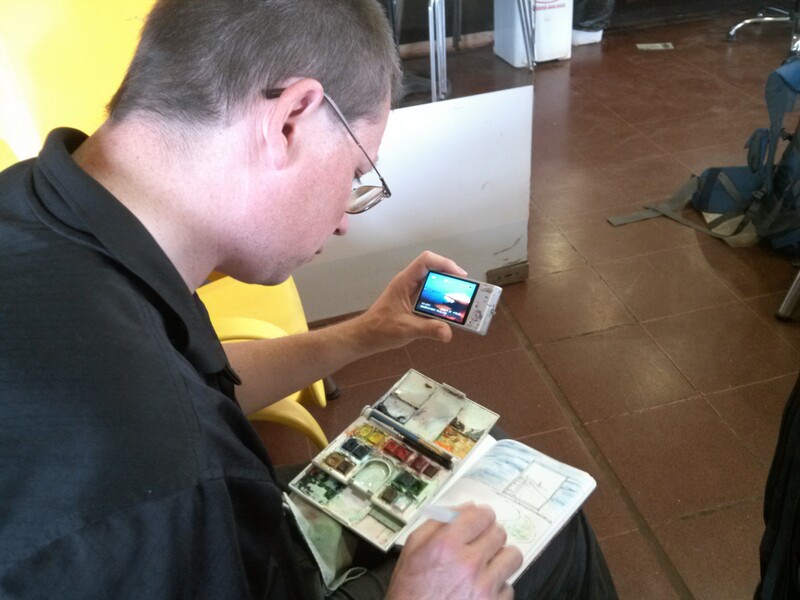 Scott working on his sketch journal while we waited to catch the bus to Córdoba. One thing I forgot to mention in our 3rd week post was the Quinceñera. There was a preacher’s daughter that was having a 15th Birthday party and the Greenwoods’ daughter was invited to the party. Scott had the opportunity to talk with a lot of preachers we would not have had time to meet if it hadn’t been for that party. After the party when we all went to pick up their daughter we talked with several preachers from different parts of the country that we had talked about wanting to visit. Now to continue where I left off in my last post. 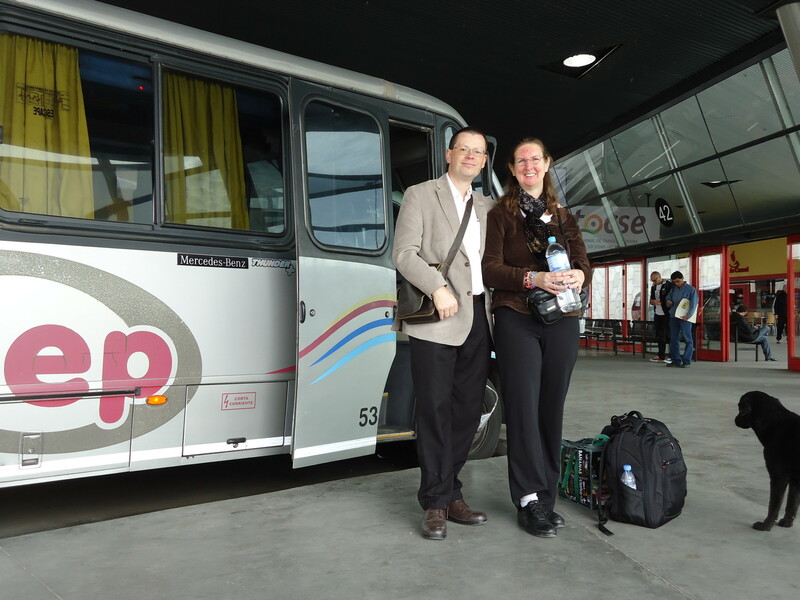 Thursday, September 25: Scott and I went to the station and caught the bus back to Córdoba, Argentina. We really had a lot of opportunities to talk about God on this trip. Every time someone asked us why we were there, we were able to share the burden God has laid on our hearts. After explaining the purpose of our trip to the college students behind us, Scott struck up a conversation with the man in the seat in front of us. The man was raised a Jehovah Witness and Scott was able to talk with him for at least an hour or two about Jesus and the Bible. Croissants and other breads with butter and jelly are a typical Argentine breakfast. In this picture we are having ours with submarinos (hot chocolate milk) but usually we drink coffee with it. Friday, September 26: We spent a very cold night on the bus and were happy that we had a room reserved for the rest of our week. We went to a restaurant for a late breakfast. I learned that a submarino is not a submarine sandwich. I also learned that I like submarinos which are a hot chocolate milk. After breakfast we walked to a section of the city we hadn’t visited yet. 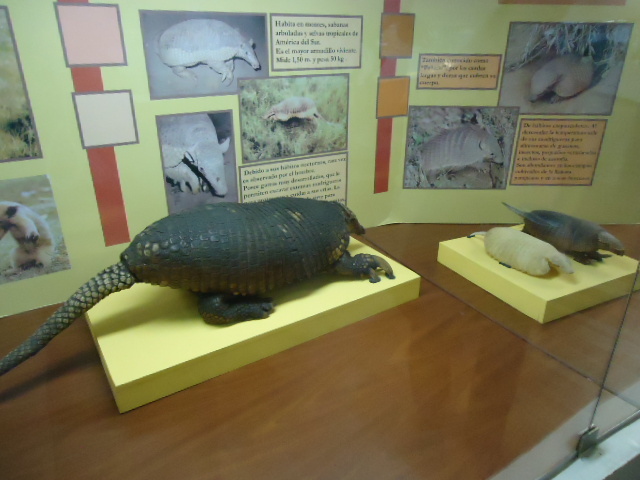 We walked around a park and visited the Museum of Natural Science. Walking around the museum reading all the signs in Spanish was very good for our vocabulary. We learned some new words. Gustavo (in white) is an improvisational actor. He was one of the first people we met in Argentina at the English Talk group. We caught up on some writing and then that evening we went to an improvisational show one of our first friends in Argentina was performing. 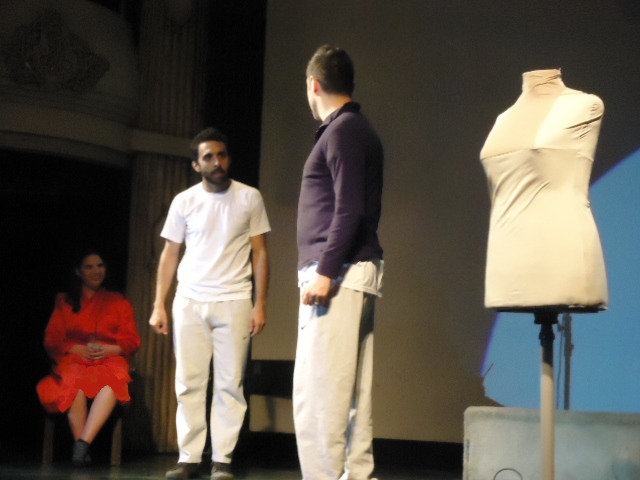 The two actors were acting out the life of a teenage girl that they picked from the audience. I didn’t understand all of it but I understood some and Scott explained the rest to me on our walk back to our hostel. They were funny and we had fun. Several of the friends we met during our first day in the country were there. We enjoyed the show and the company of our friends. The last of our trip we had two churches left to visit that we had not been to before on our trip but they were recommend to us at different times on our trip. We visited the morning service of a Non-Denominational Church during their morning service. Again I didn’t understand much but afterward Scott told me it wasn’t bad. There was quite a crowd there and they had a nice building. We visited with a lady before the services. After services were over we pretty much disappeared into the crowd and headed out to get a bite to eat and then back to our hostel. We forgot to take a picture of the church so photo credit goes to the Averys. Click on this picture to see their website. Sunday evening we got on a bus and went to Iglesia Bautista Vida Abundante (Abundant Life Baptist Church) on the south side of Córdoba. We walked a short way from the bus stop to the church. We made it to the front gate of the church early. We didn’t have to wait long until a cute little blonde headed girl about Elijah’s age came outside and talked with us in Spanish through the fence. She said that the pastor was not there but her father was inside. At that moment her father came out and greeted us in Spanish as well. She replied, “Cool!” and English immediately commenced. The two families we first met there were both Missionaries. They had only been there a few months and were very happy to share with us their experiences in getting their residence papers and moving onto the field. You can read more about them at the The Averys Online. We then met the pastor and enjoyed their services. We were really impressed by the Bible drill they had at the beginning of their evening service. They had everyone hold their Bibles up. One person called out the text to look up and whoever found the passage first stood up and read it. Scott and I both liked how that taught the members to learn their Bibles and how to find things themselves. That night Scott and I followed both families to one of their homes to visit and fellowship. We learned a lot about what all it took to bring their families over. We also learned what we need to do to prepare ahead of time. Then everyone shared stories of language learning mistakes which had us all laughing. We had such a good time that it grew late before we knew it and we called for a remise (a type of taxi) to take us back to our hostel. A funny story during our taxi ride home the meter in the taxi was broken and we thought the price was going up fast with every block. Finally Scott asked our driver about the price and he laughed and explained the meter was broken and the decimal point was in the wrong spot. So when we saw the price climbing past to 200 pesos it was actually only passing 20. Decimal points may be a small mark but they make a big difference. Monday, September 29: We were finally winding down our trip and only made a few more plans to finish up our trip. We wanted to buy a few gifts for our children and I had a list of a few items I wanted to see if they had at their Walmart and I wanted to look at Carrefour another store similar to Walmart. So around lunch time we ate a bite and went down to the bus stop to catch the bus headed toward both stores. We didn’t want to miss our stop so we got off a little early and walked to the Carrefour. A young man that got off at the same stop we did thought we were lost. He warned us not to go the direction he and a group of students that got off at the same stop were going because that was a bad neighborhood. We thanked him for the warning and explained we were actually headed the opposite direction and pointed toward the store. We walked to the Carrefour gates and realized there were no cars in the parking lot. It was around 2 in the afternoon. We had assumed they would be open all day. Walmart was only a mile or two away so we decided to walk there. While we were walking, I told Scott I wanted to buy a hat first thing. As we crossed the road toward the gates, Scott started laughing. I looked up and “Oh no!” They were closed too. Obviously we didn’t get the memo that it was a holiday and the bigger businesses were closed. Thankfully we didn’t have to walk far to the bus stop in front of the store. That evening we found this protest forming on a normally busy street. A large crowd of women and men were blocking the road banging on pots and pans. Scott took this picture of the protestors as we crossed the road. Scott asked one of the shop owners what the protest was about. She just said that someone had died 2 weeks ago. Later we found out from one of our friends that a woman and her baby were killed by her ex-husband. The people were protesting wanting justice for the woman and her baby. You can read the story in Spanish at La Mañana de Córdoba. We went by the bank to exchange our pesos back into dollars before our flight the next morning. However the bank was closed. I guess the holiday lasted more than just one day. So instead of exchanging the money we decided to have lunch. Later that afternoon we had coffee and submarinos (hot chocolate milk) with the Missionary, Bro. Masters, that we visited earlier in the month and his wife. Then our last dinner in Argentina we enjoyed with the Jacksons. They had us at their home earlier in the month and they wanted to take us out to eat before we left. We called a taxi very early our last morning. The driver made very good time to the airport. Scott is pretty sure our driver would win at Nascar. We caught our flights back home where our children were eagerly waiting with lots of hugs and pictures for us. And this ends my summary of our trip. I am also in the middle of creating a short slideshow about our trip that I will share as a video or slideshow on here soon. I will probably have a few more stories from our trip pop up from time to time as well. Thanks for following along! And as always if you have any questions for us feel free to ask them in the comments or by email. I’ve been talking so much about my husband and myself. My next post I will share some of what the kids were up to while we were gone. 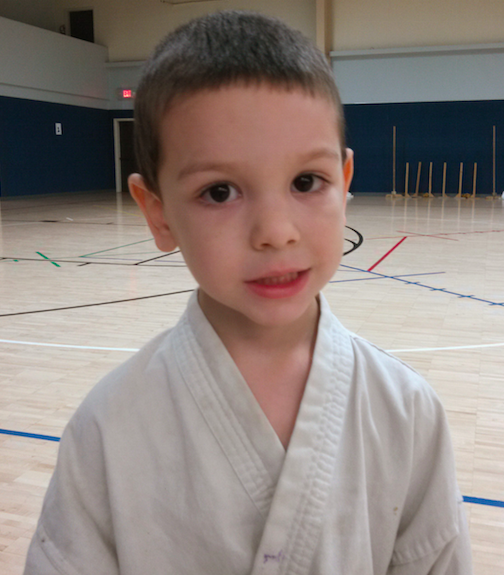 So if you’ve been missing pictures of the kids stayed tuned. I’ll be talking about them in my next post. We have just finished our third week of our time here in Argentina. We have only one more week to go before we fly back home to our family in the United States. The time has been going by so fast. We have been staying very busy and meeting so many people during this trip that it is hard to get it all into these blog posts. Let me just say that these posts are more of a summary of our trip. We have learned so much more from this trip that these posts would be very long if I wrote it all. So for now I will stick with the summary and later fill in some details when I have more time. We felt like we stepped back in time at the Train Station in Córdoba. 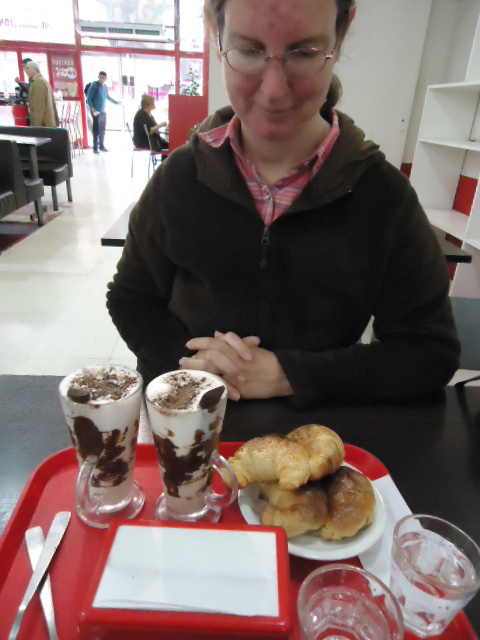 Wednesday, September 17: We packed our bags, got some empañadas, and took our luggage to the nearby train station. Scott had already reserved a room on the sleeping car for us to stay in during our overnight trip to Buenos Aires. It may have been quicker to take a bus but the train would be more comfortable and it was the same price as one night in a hostel. Scott had never ridden on a real passenger train before. I only riding a small one for a field trip in school. A train ride in a real sleeping car was a fun new experience for us. 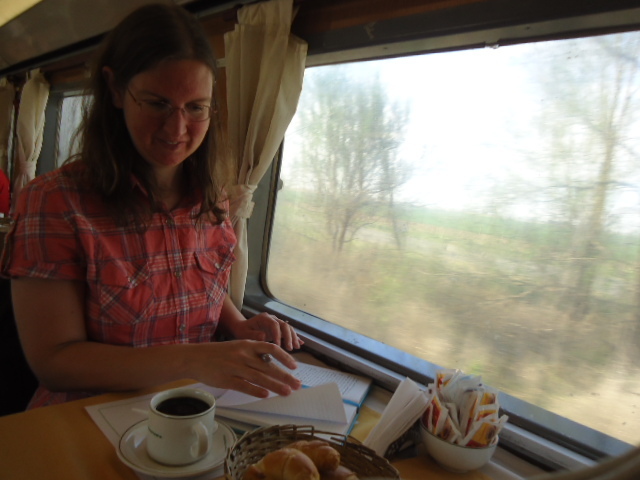 Scott took this picture of me writing in the train’s dining car. I could write a whole blog post just about the train ride but this is suppose to be a quick summary of the whole week! So I will just say for now that we really enjoyed the train ride and took a lot of pictures. Maybe I can share some of those in a later post. 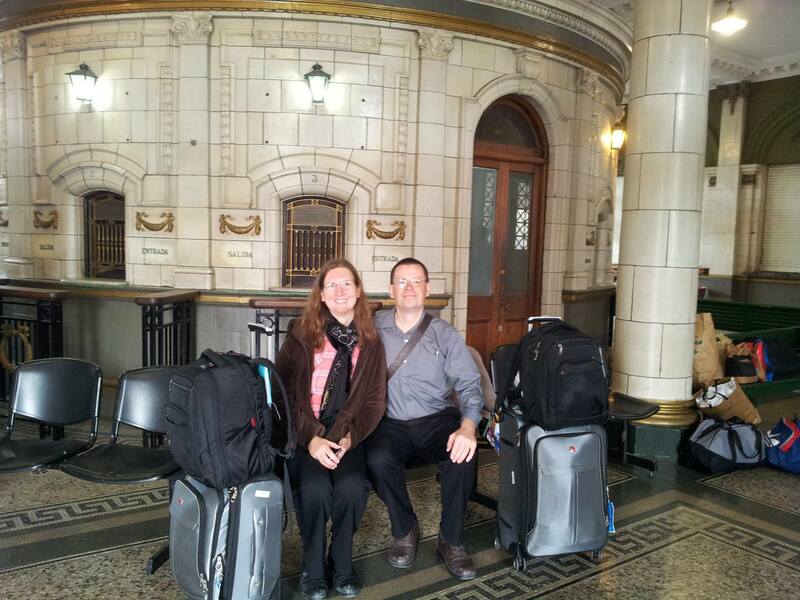 Thursday, September 18: The train dropped us off at the station in Buenos Aires, Argentina. Scott and I found a hotel. We then ventured out to explore a little of the city. We had our picture taken beside a giant over 200 year old rubber tree. 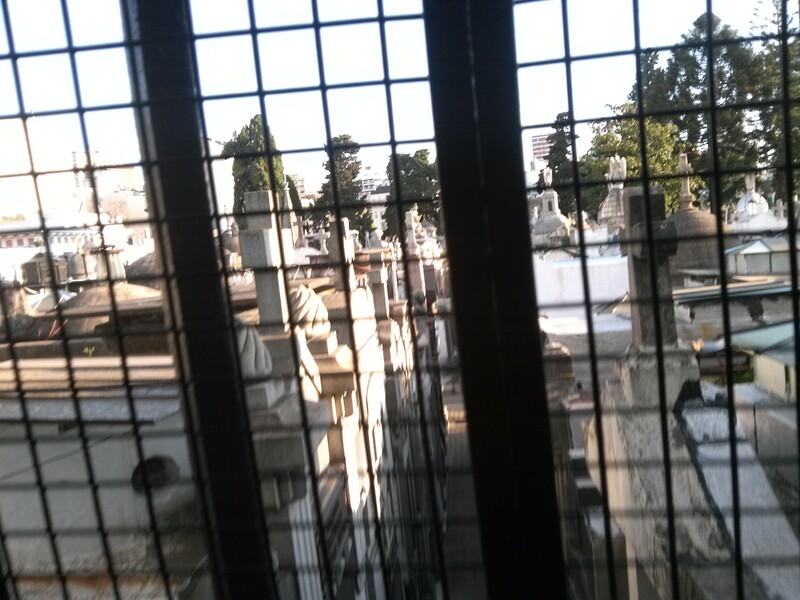 We walked through the Recoleta Cemetery. Recoleta is a very old and very famous cemetery in Argentina. After touring the cemetery, we toured the museum inside the church next door. The church has a very interesting history. The monks that once lived there had a 12 acre orchard and vegetable garden where the cemetery now stands. I have a lot of deep thoughts in places like this. 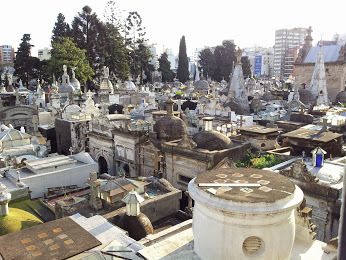 My husband and I looked out a window over the orchard where Recoleta Cemetery now stands. What would the Monks that gave up everything to live a life of poverty say about their beautiful orchard turning into a cemetery that boasts the city’s most valuable real estate? Those windows are the same windows where monks would kneel looking out over their garden and pray. They vowed a vow of strict poverty. They denied themselves earthly pleasures. I wonder if that orchard and garden was the one thing they were allowed to enjoy. Now it is a place for people to tour and for those who can afford to pay to be buried in the most coveted resting place in Argentina. Friday, September 19: We took another train to a neighboring town of Pilar. 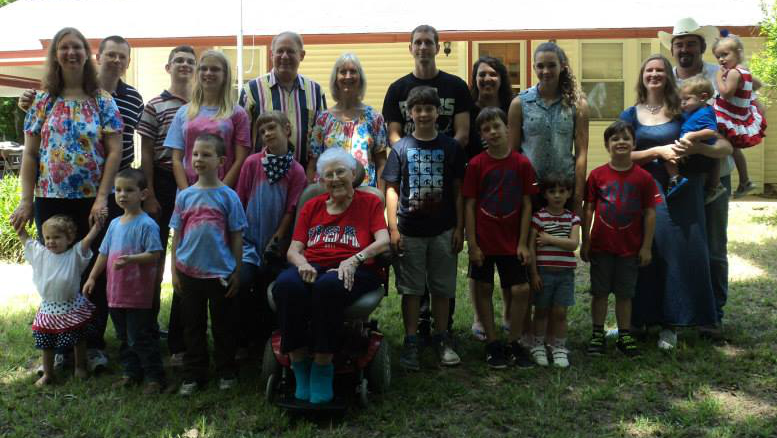 While there we met a wonderful Missionary family, the Greenwoods. We learned a lot from them. 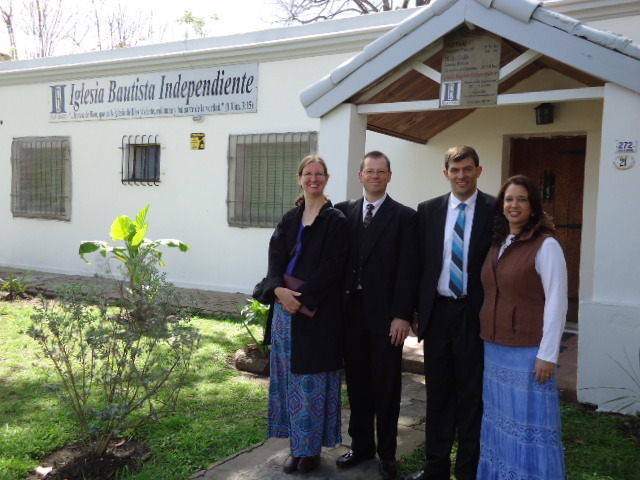 The Greenwoods have been Missionaries in Argentina for 9 years. They answered many of our questions and shown us many things about life in Argentina. Saturday, September 20: We attended the Greenwoods’ Mission for their Evangelism Ministry. We passed out tracts in the city’s plaza area where many people were enjoying the weather. We were impressed by how open people were to receiving the tracts the group passed out. 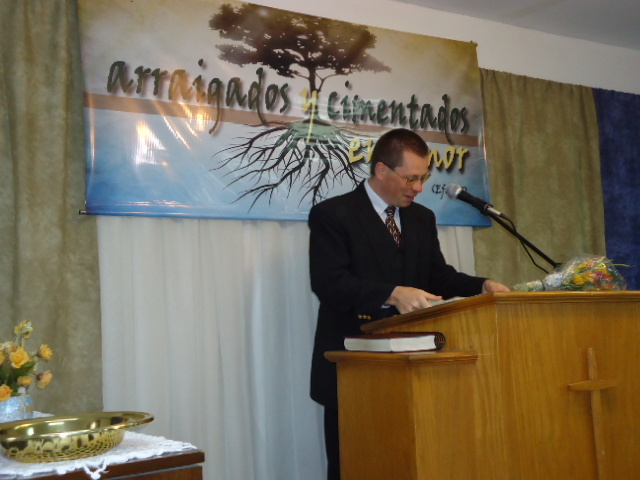 Sunday, September 21: Scott accepted Bro. Greenwood’s invitation to preach that morning and gave a message from Acts 16 about following God’s call through closed and open doors. 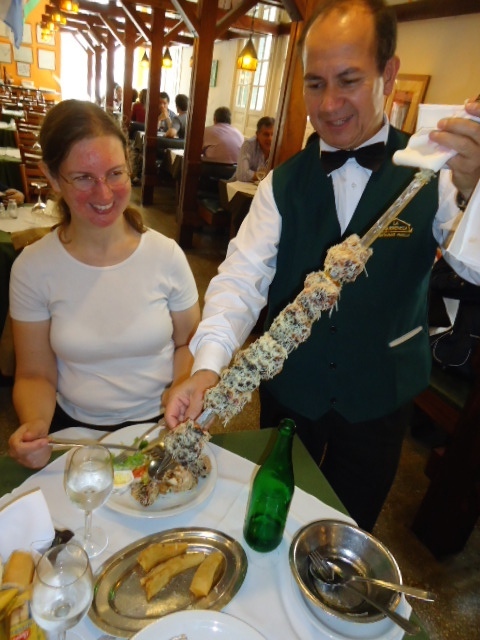 Monday, September 22: They took us to an all you can eat buffet called “Sigue La Vaca” translation “Follow the Cow”. The food was really good! We rode right above the driver’s seat on the bus to Posadas. 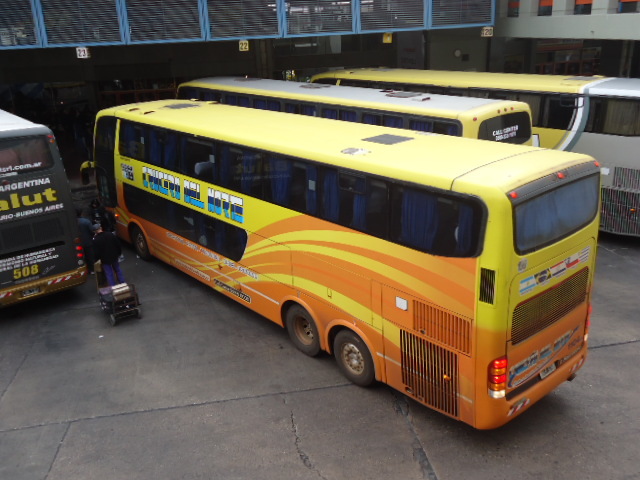 This was my first time to ride on a two story bus. After the meal we walked around a shopping center. Then back at the Greenwoods’ home we packed our bags and got ready to catch the bus to Posadas. The waiter brought our galeto on a sword at La Querencia in Posadas. 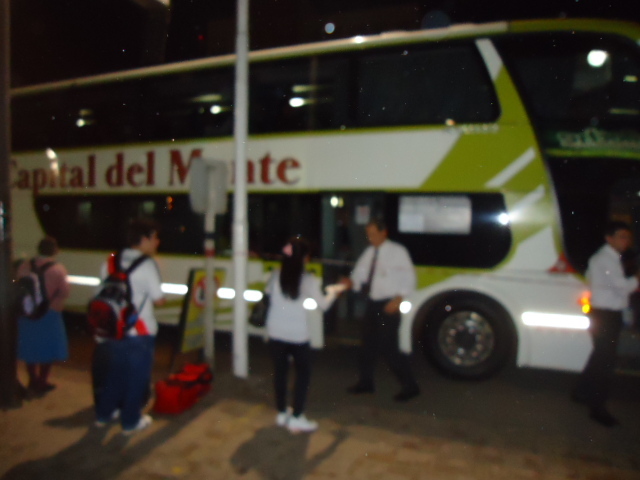 Tuesday, September 23: We arrived in Posadas took a taxi to the hotel. I got a little bit of a sunburn. Okay, for me it was a lot of a sunburn but that’s just how it is with sensitive skin and Rosacea. I don’t have to be in the sun long before my face is as red as a beet. Argentina is in the southern hemisphere below the equator. That makes their seasons opposite of ours in the United States. Right now it is Spring here in Argentina and the north is hotter than the south. 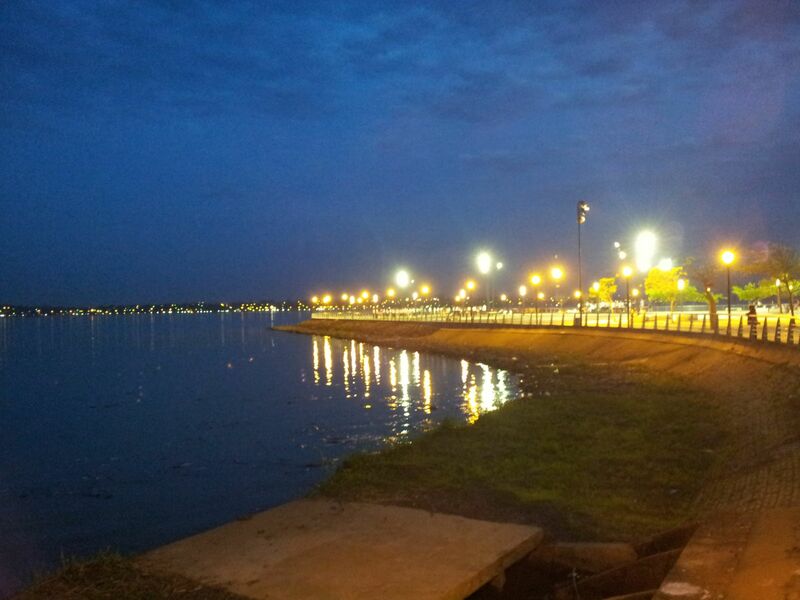 A view of Encarnación Paraguay from the shores of Posadas, Misiones, Argentina. 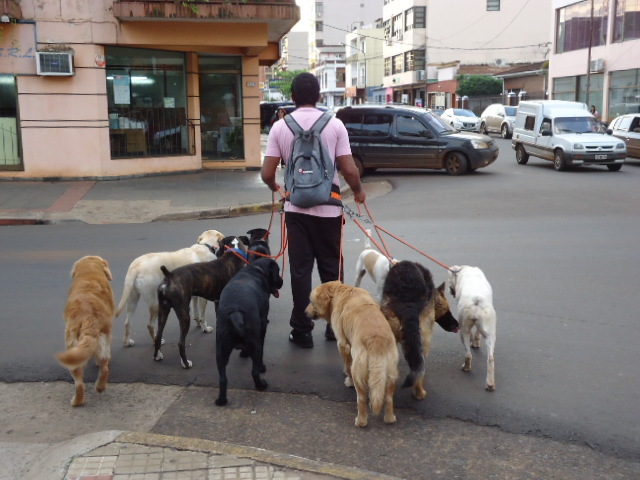 Wednesday, September 24: We take a walk around Posadas. We escaped from the heat during the siesta hours and then went back out to walk along the river. From the sidewalk we could look out across the river to Encarnación, Paraguay. Working on recording everything while at the hotel in Posadas. Thursday, September 25: Scott and I checked out of our hotel and had breakfast in their lobby. Our bus was scheduled to leave that afternoon so I stayed at the hotel with our bags while Scott went to talk with someone at a church a few blocks away. The man he talked to explained some of the beliefs of their association of churches. Not all Churches that call themselves Baptists believe the same things. After Scott got back we both sat down to get everything written that we’ve been learning. After we worked on our computers for a while, we called a taxi and went to the bus station heading back to Córdoba. Scott and I are in the middle of week 4 of our journey. It’s been a full month. After this week’s post I will share several posts taking a little deeper look at what we have seen and learned during our time here in Argentina. Thanks for following along with us. As always if you have any questions feel free to ask in the comments or by email. Stayed tuned for week 4 which I will post towards the end of this week. We are still in Argentina and although my husband and I are actually in our 3rd week here I want to pick up where I left off and share our second week with you. Thursday, September 11: We took a bus to Villa General Belgrano. Our host was their to pick us up at the bus station and took us to their home. The family we stayed with were wonderful and for the sake of their privacy I won’t give their names. If anyone reading this wants more details about any of my posts, email me. My husband suggested for privacy’s sake that I not give every detail. I am willing to share more with anyone that has specific questions that I might not have answered in my posts. Okay back to our trip. When we arrived we visited with our hosts, unloaded our luggage into their guest house, and settled in for the evening. It is interesting how we met this family. I was looking up homeschoolers in Argentina. There are some but not a lot. I found an email address for a homeschool group listed online. I emailed the contact person listed and she told me about her friends near Córdoba that also homeschooled. However the email address she gave me didn’t work. I changed directions and emailed a Missionary family in Buenos Aires. I told them our plans to fly into Córdoba. They told us about two families near where we would be that were praying for someone to come to their area. They also homeschooled. She gave me their email address and it was the same family that the other person had given me. This time I had the correct email address. Their town is Villa General Belgrano in Córdoba province. They and their neighbors have been having Bible Studies in their homes. There are two main churches in town and neither of them are very deep in the Word of God. One of the churches doesn’t even have a Pastor to lead them. 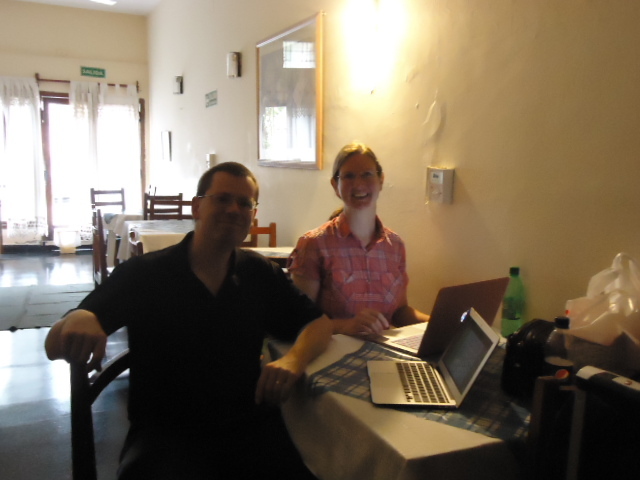 Friday, September 12: We made a short visit to La Cumbracita. It is a town that is now mostly pedestrian. I think it used to be completely pedestrian but there were quite a few cars on the roads that day. There weren’t as many as you would see in most towns. 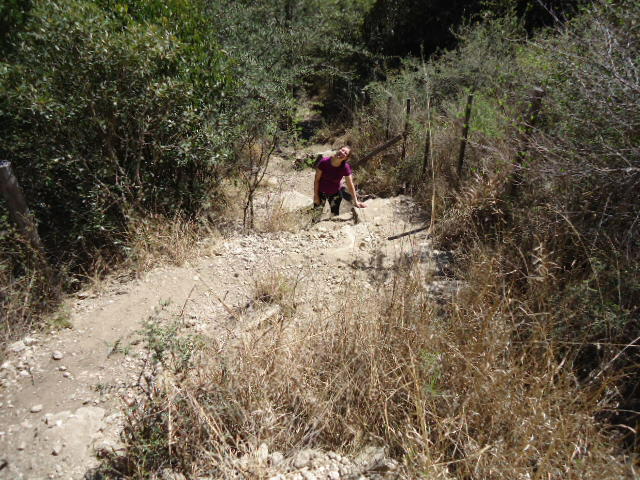 We climbed up to a very small waterfall and visited with several Argentines who were there on vacation. They were very friendly and helpful. 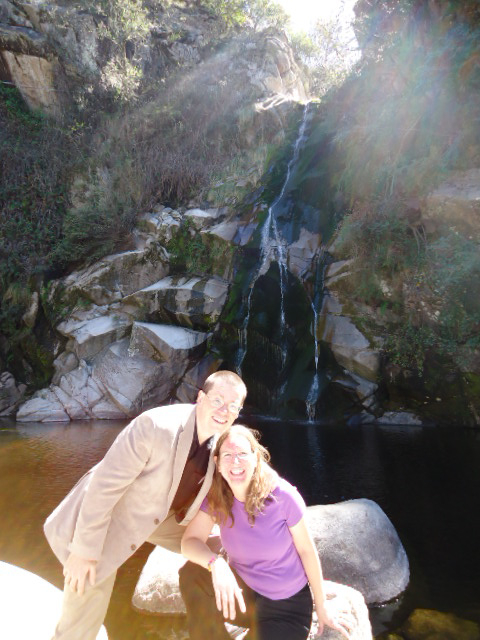 They took our picture in front of the waterfall. We rode the bus back to Villa General Belgrano and walked to the home where we were staying. That evening we visited their home Bible study. They had a good attendance of about 20 people in their livingroom. Scott had asked them to go ahead and have their services the way they normally would and he would speak at the end. Three of the children played violins during the song service and Scott played a guitar. We sang a few songs, had the Bible Study, Scott spoke, and then we had a fellowship meal. We really enjoyed visiting with all the members of their Bible Study. 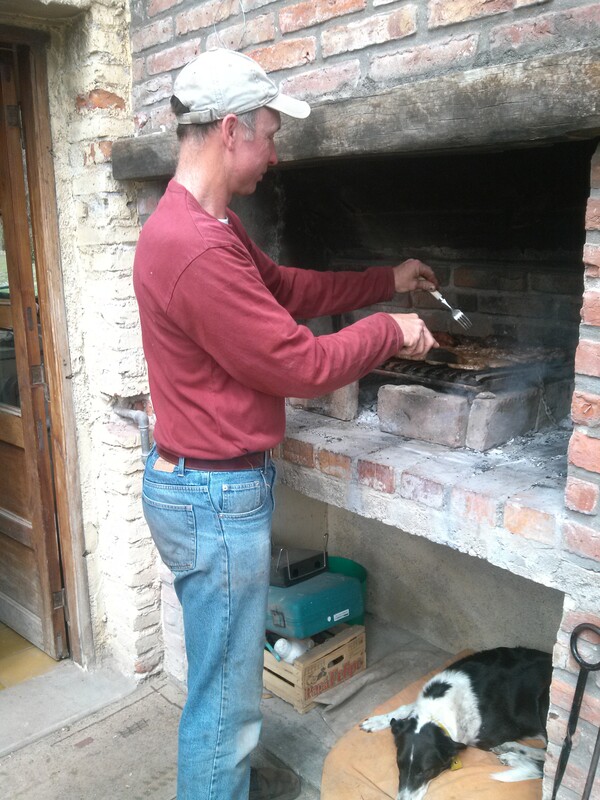 Our host preparing the asado. Everything was delicious! 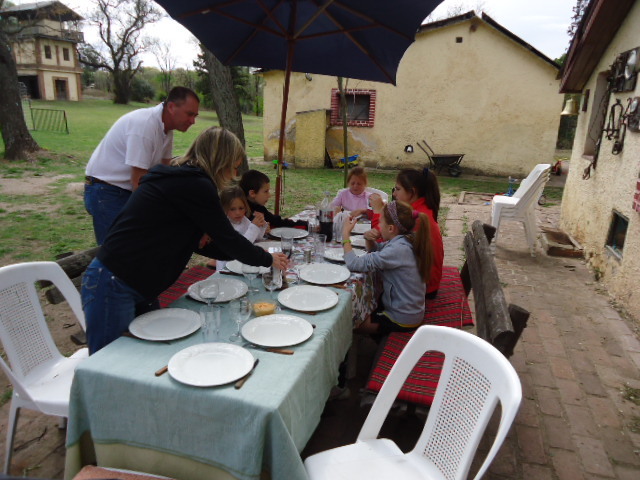 Saturday, September 13: We enjoyed the most amazing Asado at lunch. 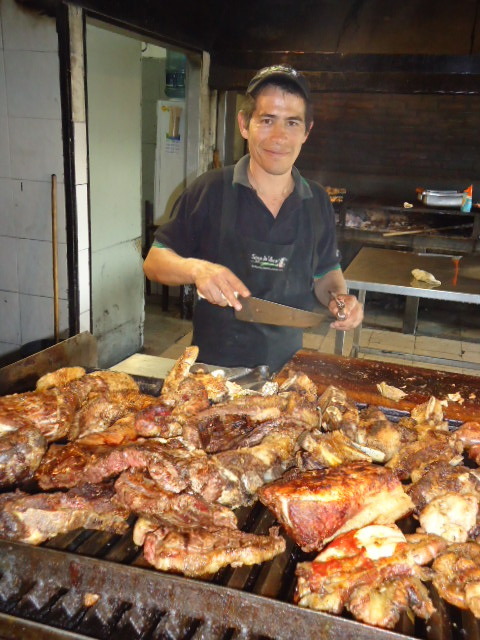 Asado is what we North Americans would call a Bar-b-que. Our hosts invited their neighbors to join us and cooked an amazing meal. 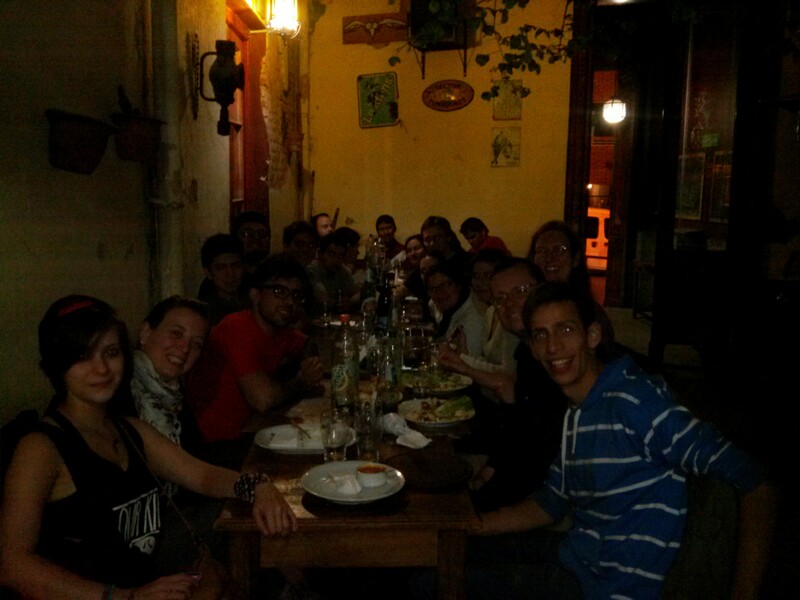 Not everyone was at the table yet for this picture but this was outside our hosts home during the Asado. After lunch we went with the neighbors to the local grocery store. We found peanut butter. There was only one kind of peanut butter there but they do have it. They also have hot dogs. Sunday, September 14: We visited a church in the morning that did not have a pastor. They followed mostly liturgy and the lady that led the service read the sermon that was sent to them. I thought she was just reading a story but Scott told me that was the sermon. It was a very short service. 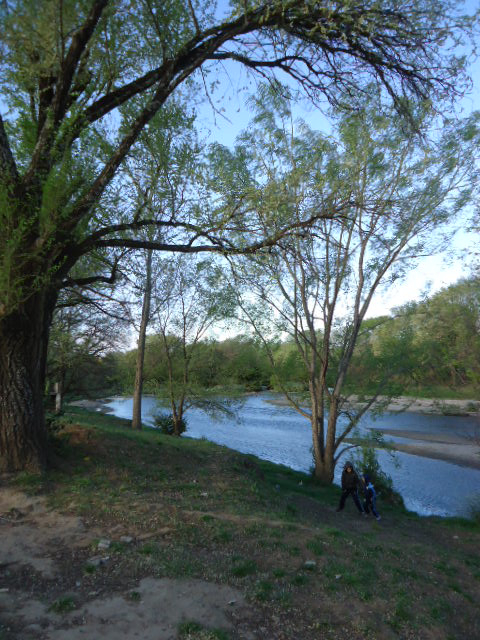 The river we ate beside. We walked back to our hosts’ house and ate lunch. We then went for a drive to another nearby village. There are a lot of people in that area and we could see a lot of potential for starting several churches there. We enjoyed cake and maté by the river. That evening we attended services at another church. The people were very friendly and welcoming. They had us come forward to introduce ourselves before the sermon. They asked Scott to say a few words and he read a Bible verse and could have gotten into a sermon but instead he held himself back to a brief devotion about God. The sermon that followed I could not understand at all. I understand some Spanish but there are times that my mind just zones out and I don’t understand a word anyone is saying anymore. My husband later told me what the preacher’s sermon was on. After the service was over we walked to the corner and our host picked us up. The evening service was so long that we got back to their house very late. They had supper on a tray for us and we were able to go back to our room and talk about the day. My husband took this picture of me. I think I was asking him if we were almost to the top. Can you believe people were running up and down this hill? Monday, September 15: We had our bags packed ready to go. Our original plan was to head back to Córdoba city sometime during that day. When we came in for breakfast they told us that their neighbor was planning to go to Córdoba on Tuesday and offered to take us if we would like. We had a return ticket but we decided that would be great to visit with him the whole ride back rather than just looking out a bus window. We were glad that they could use our return tickets. All they will have to do is change the name on it. His mother goes to Córdoba by bus sometimes and could use our tickets. 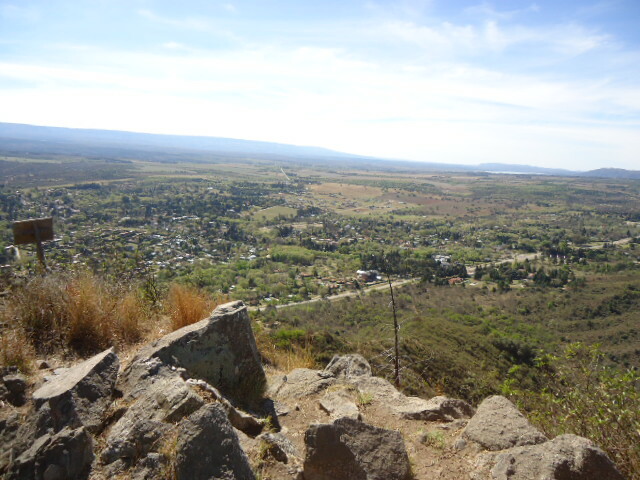 View of part of the city from the large hill we climbed. I don’t think we had made it quite to the top here. We were really glad about that and enjoyed one more day in Villa General Belgrano. During the day time while the mother was teaching her children we visited a “mountain”. Technically it was a very very big hill but to us Texans that was a mountain. It was a long hard climb up. We went up it before most people were around. It seemed like a quiet place but by the time we got to the top people were starting to come out to climb it for exercise. We started down this hill and were being passed twice by people running up and right back down. I took a video going down the mountain. I’m going to try to get that put together and share that with you at some point. That video may not get done until we get back. I had fun with it though. We walked back and enjoyed tea time with the neighbors. That night we had a very good visit with our neighbors talking about the future and then enjoying hearing stories about their families. We had a lot of fun hearing some of the cultural differences in how they each were raised right there in Argentina. They would really like to see a church started in their town. Scott and I both see great potential there but it would be a few years of preparation before we could actually start something there. It’s hard when you see a need but can’t immediately fill it. We encouraged them that they really were doing a good job. We will be keeping in touch. The group we ate with in Córdoba. They are all learning English and enjoyed practicing with us. Scott had the opportunity to talk with some of these college students about God that night. That evening we went to the English Ministry with the friends that we met the first night we arrived. They meet every Tuesday and we were able to talk with them again and met some new people. When we went out to eat after our trip I sat by a lady that eats a raw vegan lifestyle. My husband and I were eating about a 70% raw diet this past summer. We’re not vegan but we had quite a bit in common that we were able to talk with her about. She even shared with me where we can get vegetables at a really good price in Córdoba. She also told me about a church her family attends. We plan to visit there our last Sunday in Córdoba. What are our plans? Right now we still feel this is where God wants us to go. Scott told me that this trip has been different from all the Mission trips we have taken before. I agree. We came here not knowing anyone in person. Only a couple of contacts by email was all we had. God has opened doors for us from the day we got here and those doors just feel like they are opening wider the longer our visit has been. Now what I have shared here has only been two weeks. I have another week of activities to share and another week ahead of us. Pray for my parents and our children that are staying with them. 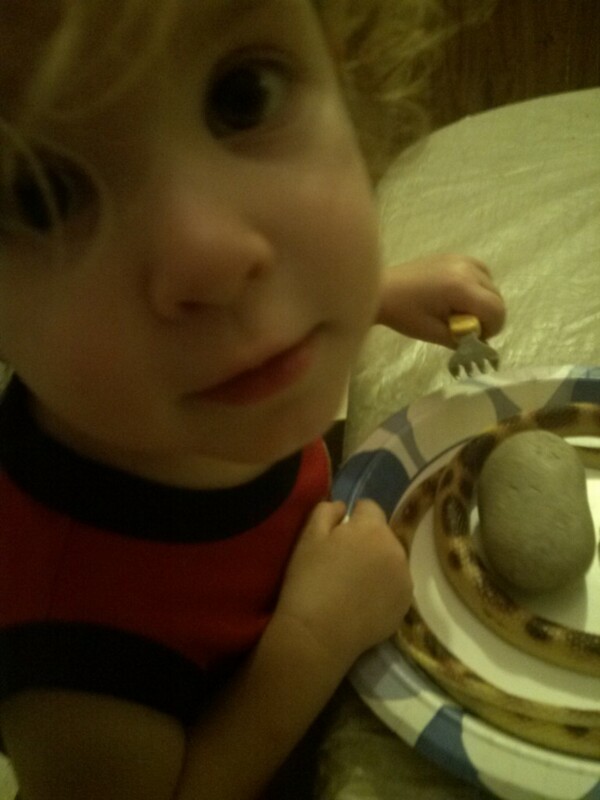 They all went through a sick spell and now our 4 year old may have Mumps. It’s hard being here away from our family when I know they need us there. Thank you all for praying for us and following along with us. As always feel free to email or ask questions in the comments. My next post will be about our time traveling to and visit in Buenos Aires.